This fly is another old one, the Alexandra. You can research this one on the net, if the legend is to be believed, this fly was banned from fishing derbies in Great Britain. I have the recipe in my father’s original pattern book and you can find it in Trout by Bergman. The Alexandra is another one of those excellent flies that seems to have been eclipsed by newer and sexier patterns. That shouldn’t have happened because this one is deadly and you need to tie it. The first thing you notice about this fly is the peacock sword for wings and tail. You may not own any but it is cheap and you should be using it. Peacock has always been popular on trout and salmon flies; that’s because of the color and the unique iridescence. It just plain looks good. To tie this fly right, you’ll need to buy the swords, not the peacock eye or herl. is dry fly hooks go ahead and use them. Then read up on classic wet flies, you’ll become a believer. For the tail, tie in four swords, as long as the body of the hook shank. Add three or four fibers from duck quill dyed red; tie these on top of the sword tail. Tie in the rib and pull it back out of the way, you’ll wind it forward later. Smooth out the body by wrapping a layer of thread, ending just behind the eye. Tie in the sliver Mylar. Remember to tie it in silver side to the hook shank and gold side out, this allows the silver side to be out when you wind the Mylar body. Trout have sharp teeth and you’ll need to take a step here to keep the fly looking good after a few brookies have chewed it up. Your rib should be tied in at the rear of the hook, waiting to be wound forward. The Mylar body material is tied in just behind the eye, waiting to be wound on. Before you wind these on, put a very light coat of head cement on the thread wrapped hook shank. While the cement is still wet, wrap the Mylar back to the tail and then wrap forward to the eye. The cement will glue it to the shank. The back and then forward double wrap makes for a smoother body. Tie it off and trim the excess. Go easy on the thread wraps here; you’ll only need three wraps. Now wind the rib forward, five turns will do it. Tie off and trim. 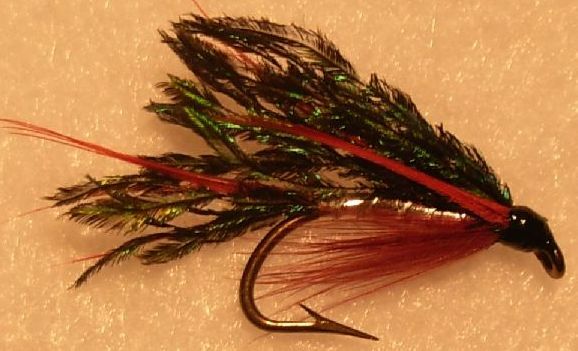 The hackle is tied in beard style, and the recipe calls for claret colored hackle. This is a dark wine color that was popular years ago and you’ll have to look around a bit to find it. I like it for its old fashioned look but you don’t need to use it, you can substitute black hackle fibers if you want to. The wing is about 10 peacock sword fibers. The wing should extend back to about half the tail length. Along each side of the wing is a narrow strip of the same red duck quill you used for the top half of the tail. If you were heavy handed with your thread wraps on this fly you’ll see a pretty big head shaping up. You can get by with just a few wraps for each step and your fly’s head will be smaller. On any old pattern, there are always substitutions. I’ve already mentioned black instead of claret hackle. You can also leave out the red duck quill sections and substitute a red floss tag at the end of the body and before the tail. The rib can be left out as well, I like to use it but that’s because I love the old classic wet flies and I like the way it looks. Take the time to tie up a few of these, tuck them away in your vest and don’t tell anyone. This entry was posted in Fly patterns and tagged fly tying, recipes, wet fly. Bookmark the permalink.